1. Heat Ghee & Oil in a pan. 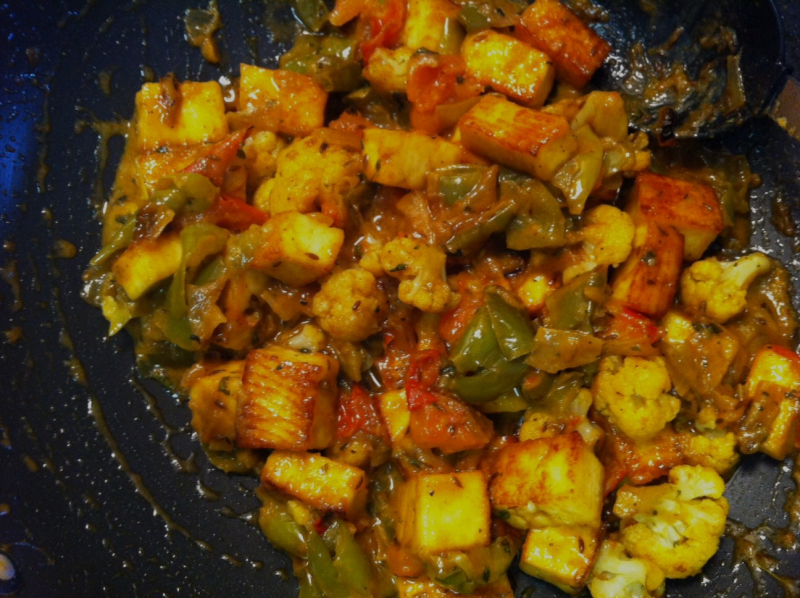 Fry Paneer till light brown & put in warm water for 3 mins, drain and keep aside. 2. In the same pan, add Cumin seeds. When the seeds are light brown, add Onion & Capsicum. Fry for a min & add Ginger-garlic paste & mix well for few secs. 3. Add Turmeric pwd, Coriander pwd, Red chilli pwd, Garam masala powder & Salt. Mix well & cook till the Capsicum are soft. 4. Put the Cauliflower florets in medium hot water for 10 mins with little Salt. 5. Add Cauliflower ,Tomato & Paneer pieces. Stir well for 3-4 mins. Add kasuri methi & mix gently. Garnish with chopped Coriander & serve hot with chapati, roti, etc. Note: Add any vegetables you like.